In 2017, nearly 40 lakh hectares of agricultural land was impacted because of water woes, resulting in a drop in the area under cultivation for crops. NEW DELHI: With one-third of agriculture activities in India still depending on groundwater for irrigation, the country’s cultivated land is shrinking due to depleting ground water levels and extreme weather conditions. This will impact the agriculture output and may upset the Centre’s target of doubling farmers’ income by 2022. “Depleting water levels are one of the major concerns for agriculture. In areas that are mainly dependent on groundwater for irrigation, we have seen a continuous decline in farm lands that were being cultivated. This, if ignored, can be problematic,” said a NITI Aayog official. NITI Aayog is conducting a study on the shrinking agriculture land and water usage in agriculture sector. According to the Economic Survey Report 2017-18, area for cultivation of sugarcane in 2016-17 was down by 10.9 per cent, compared to that in 2015-16. The total area for cultivation of cotton also saw a decline by 11.1 per cent and Jowar saw its total cultivation area dropping by 15.4 per cent. Taking cases of states individually, in Andhra Pradesh, Rabi acreage has shrunk by 7 lakh hectares in 2017 and 2.5 lakh hectares of Kharif acreage remained uncultivated in the state, mainly due to water woes. In Kerala, the area under paddy cultivation decreased from 1.9 lakh hectares in 2015-16 to 1.7 lakh hectares in 2016-17. This area was 8.75 lakh hectares in 1970-71. In North, Jammu and Kashmir, which had 8.47 lakh hectares of agriculture land in 2005-06, has shrunk to 7.94 lakh hectares by 2015-16. As per estimates of the state agriculture department, Kashmir loses an average of 1,375 hectares of agricultural land every year. In fact, the irrigation department issued an advisory to farmers in Baramullah, Kupwara, Bandipora and Ganderbal, requesting them not to go for paddy cultivation this year as due to lack of snowfall and rainfall, there is hardly any water in the Jhelum river and the streams. However, it is not just water scarcity, but also mismanagement of water that is to be blamed as India uses two to four times more water to produce a unit of major food crop than China and Brazil.The Economic Survey has already warned of the impact of the climate change and had said that it could shrink agricultural income by as much as 25 per cent in unirrigated farmlands and 18 per cent in irrigated areas in next 82 years. “India needs to take a giant step in making its agriculture sector more water-efficient than it is today. The effort is to conserve water in agriculture sector as the sector consumes a huge amount of water,” said Rajiv Kumar, vice-president, NITI Aayog. 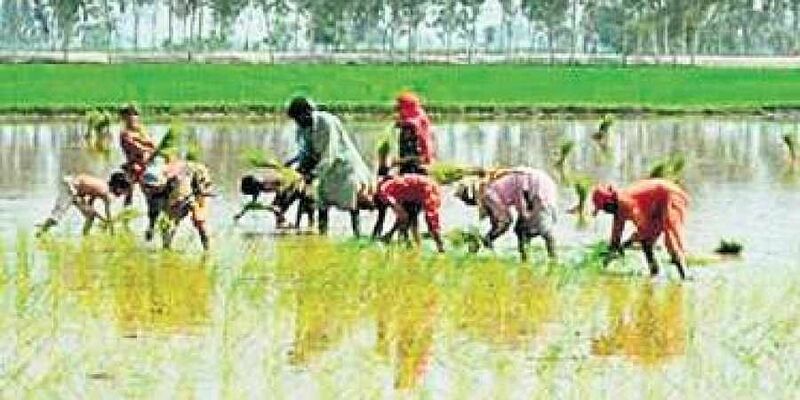 In Andhra Pradesh, Rabi acreage shrunk by 7 lakh hectares in 2017. Even during 2016 Kharif, more than 2.5 lakh hectares remained uncultivated. An IMF study says that for emerging market economies, a 1°C increase in temperature would reduce agricultural growth by 1.7%, and a 100 mm reduction in rain would reduce growth by 0.35%.